The Rock restaurant is a very well known and popular restaurant in Zanzibar, Tanzania. The restaurant is built upon a rock outcropping off the coast, making it one of the more beautiful restaurants we have ever visited. This is especially so at high tide when you have to actually take a boat to get to the restaurant. Dine on Zanzibar’s finest seafood, all while getting a 360-degree view of the ocean and beautiful coastline. The food is very good, and the staff could not have been more friendly. If you are ever in Zanzibar, the Rock restaurant is an absolute must see. 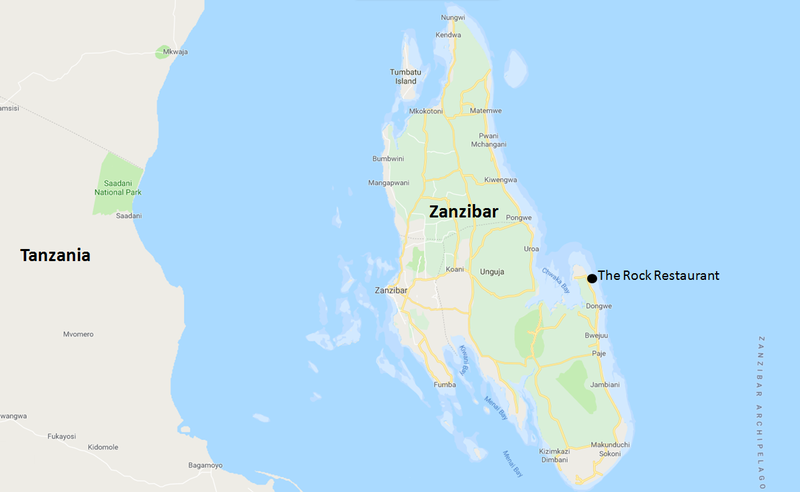 The Rock Restaurant is located on the Eastern shore of Zanzibar Island, roughly 14 miles North of Paje Beach. If you are coming from Stown Town, it is about a 1 hour and 15-minute drive from the airport to the restaurant. For more details, I have included a map for you to review below. Want to get a sense of what it is like to dine at the Rock? Check out this short video to get a feel for one of this world’s most beautiful restaurants.